A gently shaped 18ct white gold ring , set with a row of glittering diamonds for a dash of sparkle. A chic ring with a unique design affording contemporary style. 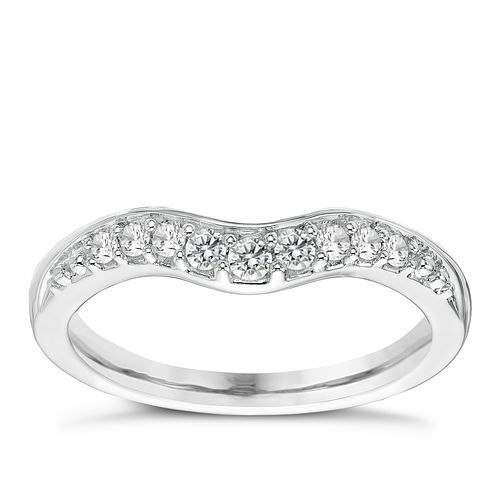 18ct White Gold 0.15ct Diamond Shaped Band is rated 5.0 out of 5 by 2. Rated 5 out of 5 by Anonymous from Absolutely beautiful Bought this wedding ring the other day and it is so amazing, it's sparkly and just beautiful, also had 10% off as my engagement ring was from here. Perfect. Rated 5 out of 5 by Anonymous from Beautiful Ring So the ring itself is absolutley gorgeous and it was difficult to find a ring to fit into the shape of my sapphire engagement so i was pleased i came across this. Its very blingy which is what i was looking for and only a small line of white gold above the diamonds so it wont look dull from the front at any point.